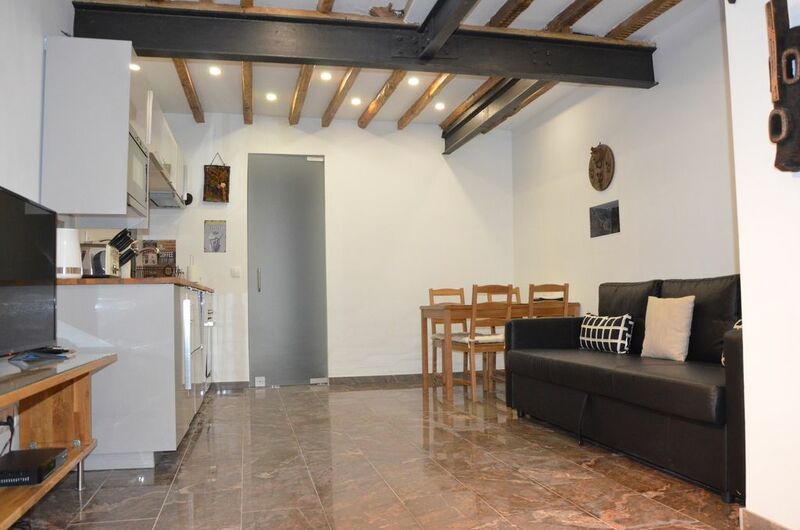 This 30m2 apartment is located on the ground floor of a quiet cobbled street. This 30m2 apartment is located on the ground floor of a quiet cobbled street, with many beautiful renovated buildings. The bedroom has a bunk upper bed and a closet. The kitchen is fully equipped, and there is one full bathroom with shower. The living room has a big and comfortable sofa bed. This self catered apartment has a wide range of services very close: metro station (8 minutes walking), bus, supermarket, mini-market, souvenir shops, pharmacy, clothes stores, cafés and bakeries. It is also a privileged location given the existence of two metro lines close by, the Green (city center) and the Red Lines (from and to the airport). The apartment is very centrally located, with two metro lines close by, and is a twenty minute walk to city center. This is one of the most ideal locations to visit all of Lisbon, with excellent access to public transportation: buses, and two metro lines are available to take you across town. The center of Lisbon is a twenty minute walk if you so choose. Close to the Technical University of Lisbon. Centraal gelegen, vlak bij metro, goed verzorgd appartement, praktisch ingericht, van alles voorzien. Perfect if you're visiting Lisbon on a budget! Comfortable, simple and clean with great connections to every other part of the city. Vanessa, who was asked to help us out in the apartment owners absence, went above and beyond helpful and the communication prior to our visit was excellent. Would definitely come again if revisiting Lisbon!